Barnes and Noble has four of its Nook Kids eBooks up for the Cynopsis Kids !magination Awards. The four Enhanced NOOK Books to be nominated in the ebook category at the first annual Cynopsis Kids Awards are Go Dog Go! (Random House), A Charlie Brown Christmas (PEANUTS Worldwide), Birdies Big-Girl Shoes (Little, Brown Books for Young Readers) and You Will Be My Friend! (Little, Brown Books for Young Readers). All are available in a fun, engaging, digital format, only for Barnes & Noble customers on NOOK Tablet and NOOK Color. Most of these books that have been nominated have various cool features that separate them from the competition. 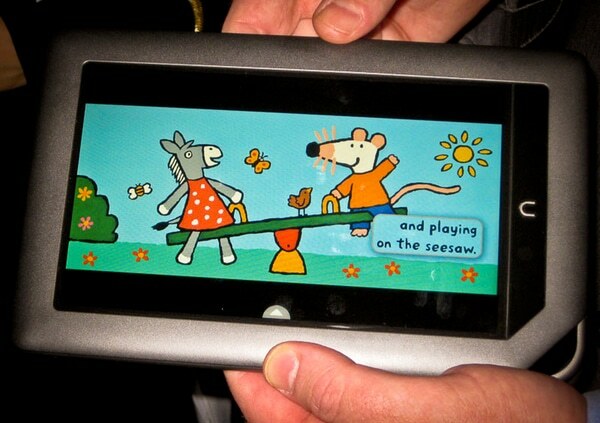 The Barnes and Noble Read Aloud feature found in the Nook Tablet is one of the main draws. It allows the narrator of the book to read to your kids, but also has the ability for parents or anyone else to narrate the book for you. Cynopsis: Kids! is a daily e-publication covering the kids’ entertainment business and is the must-read by leaders in the programming, licensing, and kids’ marketing arena. Celebrating 10 years in 2012, Cynopis: Kids! is one of the most comprehensive sources of information for the kids’ reading and entertainment industry. The Cynopsis Kids !magination Awards honor the year’s most outstanding achievements in content creation and marketing between October 2010 and December 2011. Presented by one of the industry’s most-read and trusted publications, Cynopsis Media, the awards are open to all production companies, studios, producers, networks, animators, developers, licensing companies, marketing and PR firms, ad agencies, and toy companies.